Felis caracal can be found in the Veld Grassland in South Africa, and in central Africa and India from 30° North to 35° South latitude and from 20° East to 25° West longitude. This environment is generally dry and hot. The cat's habitat can also be savannah, scrub and acacia woodlands, or mountains and hilly areas. has a short coat whose color varies from tawny-brown to reddish-grey, sometimes even getting as dark as wine-red. Its head is shaped like an upside-down triangle. The ears are black on the outside and pale on the inside, with two-inch tufts of black hair coming out of them. The fur around the eyes is paler than the rest of the coat. The caracal has powerful jaws on a short muzzle. Its claws can retract into its large paws. It is faster than any other cat its size. Alden, Peter. National Audubon Society Field Guide to African Wildlife. New York: Alfred A. Knopf. 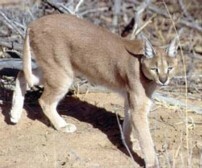 1995.
:The Wild Habitat: Caracal (Felis caracal)." "Catfolk Species Accounts: Caracal (Caracal caracal) [Sub-Sagaran Africa]."